1 Preheat oven to 450°. 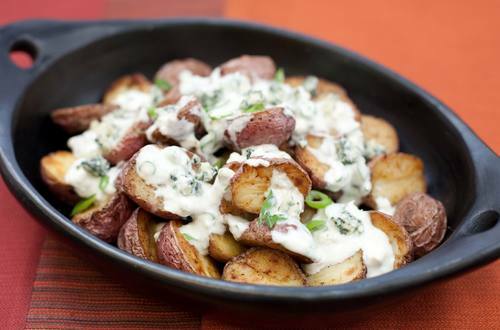 Toss potatoes with 1/4 cup Hellmann's® or Best Foods® Real Mayonnaise, then arrange in single layer on baking sheet. Roast 35 minutes or until golden brown and tender, turing potatoes once. Arrange potatoes on serving platter. 2 Meanwhile, combine milk, remaining 1/4 Hellmann's® or Best Foods® Real Mayonnaise, mustard, garlic, pepper and cheese in microwave-safe bowl with wire whisk. Microwave at HIGH 1 minute, stirring once halfway through. Stir (mixture will be lumpy), then drizzle cheese sauce over potatoes just before serving. Sprinkle with green onions.